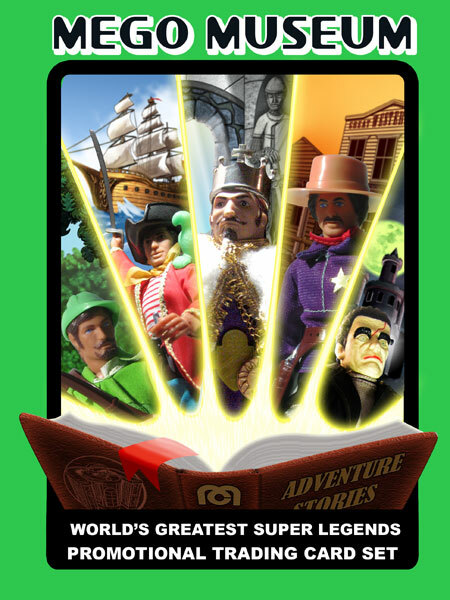 The World’s Greatest Super Knights , Super Pirates , Robin Hood and his Merry Men, Heroes of the American West and the ever-popular Mad Monsters. Among them, they represent some of Mego’s best work in the 8 inch line. Please note that World’s Greatest Super Legends is the Mego Museum’s designation for this category, it was never an official Mego term. By going with figures from literature and history, Mego was firstly able to appeal to a very wide audience. Beyond the limited genres of Superheros and Science Fiction they presented marvelous representations of archetypes that little boys are genetically hard-wired to appreciate. Cowboys. Knights in shining armor. PIRATES. Monsters. Swashbucklers. Certainly, they were also figures that some parents were more inclined to purchase, either for vaguely educational reasons or because they themselves had childhood attachments to the subjects. Additionally, these also seem to be dolls that were collected by doll collectors, not just sci-fi and comic fans. Consequently, they are found in numbers and conditions that belie their production. The Knights were only on store shelves for a year or two, yet they are often found never removed from their mint boxes. The added advantage of using these characters was that they are properties in the public domain. Not having to pay a license fee Mego was able to divert a few extra pennies to the individual dolls. The results are chromed swords, lace ruffles, embossed and painted shields, the WORKS. Contrary to rumour, these lines were released by Mego themselves and were not “backdoored” in Hong Kong as implied by other sources. Some of the newer additions to the Galleries are the revised American West section with new foreign packaging shots and an amazing glimpse at the original Gray Morrow Art.